The Christmas Holiday Season officially begins with the Thanksgiving holidays. It’s the season for holiday plants, most notably, poinsettias, the official Christmas plant. I’ve been visiting poinsettia growers and the holiday plant is right on schedule for the holiday season. Even though poinsettias are quite beautiful when purchased, it’s a holiday plant produced as a disposable plant and should be tossed once they decline later after the holiday season. Those that want to keep them for next season are often disappointed in the results. It’s nearly impossible for homeowners to obtain greenhouse quality plants and it’s not cost effective. With proper care, poinsettias can last throughout the holidays. 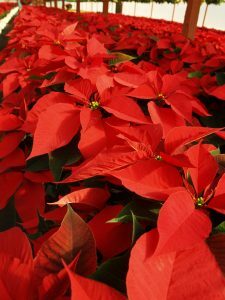 Below are tips from poinsettia growers on how to keep your plant looking its best for the holidays. Select plants that have healthy leaves with tight flower buds. Avoid plant with buds that are open. Use a large, roomy shopping bag or box to protect your plant when transporting. Most growers provide plastic sleeves to protect the plant. Locate your plant in indirect sunlight for at least six hours per day. If your placement has direct sunlight and can’t be avoided, diffuse the light with a shade or sheer curtain. Maintain the room temperatures between 68 – 70° F. If you are comfortable, so is your poinsettia, however the cooler the better. Poinsettias should not be exposed to temperatures below 50° F. Poinsettias are very sensitive to cool temperatures, so avoid placing them outside during the winter months. Avoid placing poinsettias near cold drafts or excessive heat such as appliances, televisions, fireplaces, heating or ventilating ducts. Be sure to water your plant when the soil feels dry to the touch. Please note that over-watering quickly kills poinsettias. Do not allow it to sit in standing water. Always remove a plant from any decorative container before watering, and allow the water to drain completely. Poinsettias are not poisonous plants. It was a myth perpetuated in the early 1900s and has remained with us to this very day. Display and enjoy your traditional Christmas plant throughout the holidays.